What to know: Stunning documentary about one woman's quest to change the lives of her fellow Palestinian refugees one bite at a time. 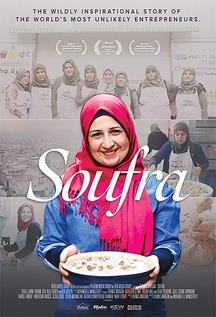 Soufra is a fantastic film filled with delicious-looking food and inspiring messages for women and others. This documentary is clearly made with passion, purpose and heart. It is a little heart wrenching, but still fun and interesting at the same time. The production values are high, particularly the cinematography. I felt so connected with the women in this film and was really intrigued by their stories, as well as what they have to say. This is an incredible film in so many ways. The filmmaker follows a group of women in a Lebanese refugee camp who enjoy and have a passion for cooking. They are hired by a fellow refugee, named Mariam, to start a catering company called Soufra. The film documents the struggles of these women being unable to purchase a food truck for their business. Even though they raise the money to purchase it, thanks to a Kickstarter campaign, it is still difficult for them to get the proper permits to own the truck, due to local laws. What really intrigued me initially, was the beginning scene in the kitchen. It is so lively, entertaining and captivating. The introduction to a film is so important. The rest of the film is equally well shot. The camera quality is clear and the cinematography is pretty spot on. This film really is quite entertaining and educating at the same time. I thoroughly enjoyed watching it and I because every aspect is so incredible. The messages the film promotes are completely pure and positive. These women deal with really tough situations and lead extremely tough lives. However, they manage to stay strong and powerful regardless. The message is about never giving up or quitting, even when it feels like the entire world is telling you to. Never loose sight of your goals. I recommend this for ages 10 to 18, as well as adults and give it 5 out of 5 stars. I am so impressed with the women in this film and everything they have accomplished. I admire them all very much. This is a film that is truly incredible and one I will remember for years to come. This film is available at select film festivals this fall so, check to see if it is playing near you. South of Beirut, Lebanon is a 68 year old refugee camp housing refugees from Palestine, Syria and Iraq. Many have lived in this camp their entire lives-- Mariam AlShaar is one of them. Now, Mariam has pulled the women of this camp together to do what has never been done before. They started with a small kitchen from a micro-loan. With nearly insurmountable political odds against them-- they look to start the first refugee food truck. Their journey is one of many ups and downs but it is the community that is built, their sense of hope and how they see themselves that makes this a moving, touching film about their journey. Mariam has been known as 'the crazy lady' and now she will show just how crazy she is.